In true V.C. 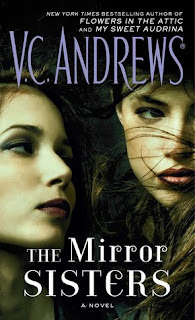 Andrews style, Mirror Sisters is fantastically dark and a tad bit creepy. The writing is top notch and definitely draws you deep into this disturbing story. Haylee and Kaylee are identical twin sisters and although their mother loves them dearly she is obsessed with everything being entirely equal for them. If one does something wrong both girls get punished. She even believes that they must even think the same thoughts at the same times. She openly expresses thinking of them both as halves to the same person and together as her perfect daughter.... singular. The girls learn pretty early on what their mother expects of them and try desperately to please her by always being the same and equal in all things. Even as it drives a wedge between their mother and father. The problem with this is that one of the girls has much darker thoughts and motives than the other. Most of the book is establishing the extremes of their home life and starts to have clues into the one sisters darker nature. The story was a bit repetitive at times but I was too invested in the overall plot to worry about that. Although it is hinted that something goes terribly wrong I was still amazed at just how far things got at the end of the book. That cliff hanger is just too much! I absolutely have to read the next book to find out what is to come of this horrible situation. *I received a copy of this book in exchange for an honest review. April K.